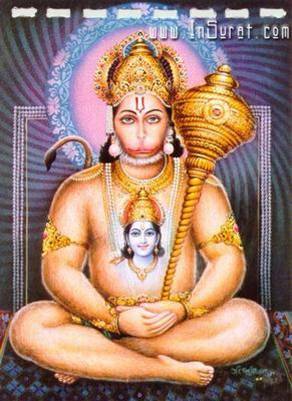 ajADyaM vAkpaTutvaM cha hanUmatsmaraNAdbhavet.h ||"
all accrue upon remembering Hanuman. •The Hanuman mantras are very effective for all Saturn related problems, for health, to avoid and overcome troubles caused from enemies and to avoid imprisonment. •Lord Hanuman is worshipped all over India with various names like Anjaneya, Hanumanji, Maruti,Bajrang Bali, Mahavir ,Pavan Kumar. He was born to the Wind God and Anjana Devi. 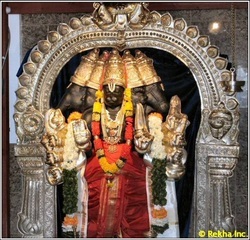 He is one of the seven chiranjeevis(immortal ones). The Sun God Surya is considered as his Guru.The Valmiki Ramayana has a seperate section called Sundara Kandam or Sundar kand, which describes in detail the leelas of Lord Hanuman is his search for Sita , across the sea. The Sundara Kandam comprises 2885 verses and the word Sundara means beautiful.The esoteric significance of the sundara kandam is important. The ocean represents the ocean of samsara. Lord Rama represents the paramatma and Sita devi represents the jivatma. 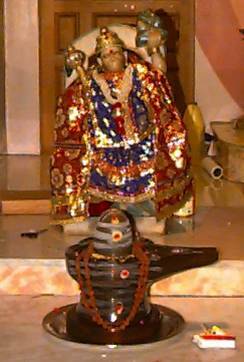 Hanuman represents the Guru or Divine teacher. The origin of Sri Panchamukha Hanuman can be traced to a story in the Ramayana. During the war between Lord Ram and Ravana, Ravana took the help of Mahiravana who was the king of pathala. Lord Hanuman in order to protect Lord Ram and Lakshman formed a fortress with his tail. But Mahiravana took the form of Vibeeshana and took Lord Ram and Lakshman to pathala loka. Hanuman entered pathala loka in search of Rama and Lakshmana.He found out that to kill Mahiravana he had to extinguish 5 lamps at the same time. So he took the Panchamukha form with Hanuman, Hayagriva, Narasimha, Garuda and Varaha faces and extinguished the lamps. Mahiravana was killed immediately. It is clear that hanuman is the vital breath, the prANa, the Atman, the Self ~ and this unified wind is all-pervading and all-conquering ~ and it is the praNava ~ oM. hayagrIva (vyAna or dhanaMjaya) ~ the upper (or north-eastern) wind. the north-eastern wind (hayagrIva) is nakula's sughoSa shANkha. to the north (the perspective of bhIma) we see the southern face (vAmadeva) ~ and the face of varAha. And simultaneously expressed, this controlled vital breath (now undivided Atman and personified as the pancamukha hanuman) is the same pAncajanya shANkha of kRSNa ~ which is both pancAkshara mantra and praNava. fresh sindhoor should be applied after bathing the Lord's idol. The devotee should always wear the sindhoor as a tilak on his forehead while chanting the "moola mantra" that he has been initiated into by his Guru. The remaining sindhoor can be stored for future use or put over a snake mound or into a lake; It should never be given to anyone other than his wife under any circumstances.